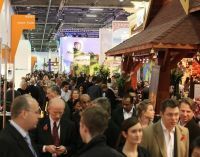 World Travel Market (WTM), now well established at London’s recently extended Excel exhibition centre, opened last Monday with its usual fanfare and train problems. The Dockland Light Railway (DLR) was keen to promote that there would be services every two minutes to Custom House (the traditional way into the show) or via Prince Regent, nicely re-built, but a very long walk to the press centre. The trains did run pretty effectively for most of the four days. What the DLR failed to publicise was that Custom House and Prince Regent do not have extended platforms yet and only two-coach trains can use the stations rather than the three units used on the rest of the system. Next year we are promised three-car trains and a direct service to Stratford. Canning Town was very unpleasant at times due to overcrowding and yes a train did break down mid-morning on the first day. 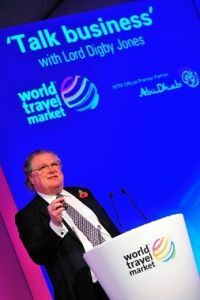 From the start on Monday WTM had a real buzz about it although an industry report revealed caution among top executives. The survey found that it will struggle to return to pre-downturn demand levels and profitability until 2016. Four out of ten executives see increased taxation as one of the biggest issues facing the industry over the next five years. But for all their caution guests and exhibitors were at WTM 2010 in record numbers with 24,000 visitors supported by 17,000 exhibitor personnel and nearly 3,000 press. The catalogue listed 5,121 exhibitors representing 187 countries. Jeff Cacy, Managing Director of Global Airline Marketing Services at Boeing, opened the show and announced a Saudi Arabia order for eight Boeing 787 Dreamliners and 12 777-300 ERs with an option on another ten 777s. The 787s maiden flight was on film for all to see. People go to the show to network; to make serious business enquiries; and to attend the many symposiums and press conferences on a whole range of travel related subjects. Typical was a ‘Low Cost Carrier’ master class hosted by John Strickland on the Tuesday. In what might be seen as a “classic” of his company in getting something for nothing Ryanair was not actually exhibiting at the show. Ken O’Toole, Ryanair Director of New Route Development, said the airline has 22 new aircraft coming into service next year, 13 of which still have to be allocated to routes. Rumours do exist of white tailed Ryanair ‘planes sitting at various airports. “We will engage with the local and regional governments to focus on the development of these facilities and increase inbound tourism to them,” he told a packed audience. He quoted both Dublin and Stansted losing 25% and more of traffic due to high charges. “Airline Industry in Turnaround” was another seminar with air travel participants of the highest quality. 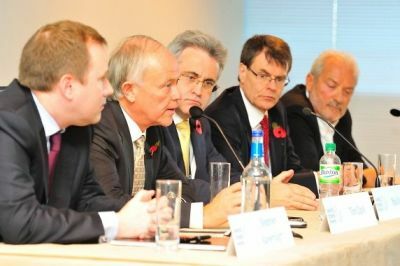 Colin Matthews, BAA CEO; Stephen Kavernagh, Aer Lingus Commercial Director; Paul Kehoe, Birmingham Airport Chief Executive; Sertac Haybat, CEO Pegasus Airlines and perhaps most interesting of all Tim Clark, President of Emirates, a regular at WTM. The ash cloud crisis in May was discussed, highlighting the importance of air travel and its benefits. “The ash cloud crisis brought a degree of balance to the debate about the costs of aviation and showed the extent to which we are dependent on aviation for our global economy,” said Colin Matthews. Birmingham Airport’s Paul Kehoe blamed a lack of leadership but credited airline bosses from BA and KLM for getting onto planes to check the severity of the ash. He said the airline industry lacked its own Al Gore, “someone saying what a brilliant job you do. 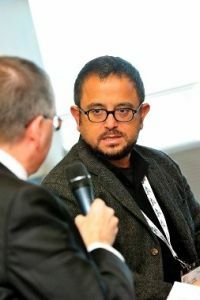 Otherwise we’re always on the back foot and we lose out to environmentalists.” We were reminded that the BBC’s Aaron Heslehurst said much the same thing at a recent Middle East air travel conference. A current controversy is increase in Air Passenger Duty (APD). Tim Clark was emotive when he said that the world wants to come to Heathrow, “but the Government seems to be working in the opposite direction,” adding that Emirates will “adjust if demand falls off.” Citing Newcastle he noted that since Emirates introduced a service, trade to the Middle East had gone up from £100m per year to £300m. 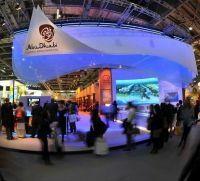 Emirates and Oman Air took significant stand space, and Continental again exhibited, for the last time under that name. Many smaller carriers took space in the national areas, or as part of a consortium, a sensible way of being seen in difficult times. Whilst something in the order of 40% of overseas visitors came in on BA the UK’s largest carrier chose once again not to be seen. Partner Iberia took a small stand.